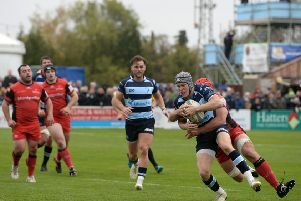 Nottingham Rugby have announced the signings of three players from Bedford Blues as both sides continue to shape their squads for next season. The Green and Whites have secured the signatures of Daryl Veenendaal, Antonio ‘TJ’ Harris and Viliami Hakalo following strong performances in the Championship this year. Nottingham Head Coach Martin Haag said, “I’m delighted to have signed the three Bedford Players as Bedford always try and play some rugby which means the lads will fit into the style we want to play. “Darryl is someone to replace Sean Romans and with him having already played 150+ games for Bedford it will give us some experience at scrum half. “TJ Harris is someone who has forced his way into the Bedford first team. He has the raw attributes and wants to push himself to be even better. “He will learn a lot from Jon Vickers and our forwards coach Neil Fowkes and will provide stiff competition for our forward pack.